Killer Characters: A Formula for Murder! My name is Kate Connolly and I’m a new mom over my head. Well, aren’t all new moms? Who knew adding a tiny 6lb addition to my family would be so much work? She is lovely though. Laurie, is my little peanutty-pie. Laurie and I fill our days missing appointments…ahem, I mean re-scheduling missed appointments, nursing, diapering and chasing down bad guys. Mostly I chase the bad guys and she naps - but not generally at the same time. It all started when I had the crazy idea to become a Private Investigator while on my maternal leave. The idea didn’t seem crazy at the time. I blame it on the hormones. You can read about our latest adventure in FORMULA FOR MURDER. Laurie and I get up front and personnel with some French Diplomats who have a little more on their mind then diplomating – is that a verb? Oh well, you know what I mean. The baby is crying now, so I have to go tend to her. Tell me what you did when your baby was small to prevent your mind going to mush? Does it make me less of a mom because I need an adult-sized challenge (like starting my own PI business) to go with my pint-size love? 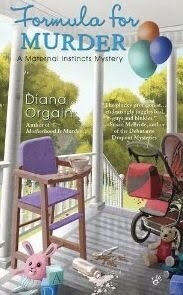 Visit Diana on the web and at her fantastic blog, The LadyKillers. And, of course, if you haven't checked out the Maternal Instincts Mysteries, start with the first (Bundle of Trouble) or jump right into the most recent (A Formula for Murder). Kate, you're a brave, brave woman. Good luck! You're a good mom, we all need challenges. I understand the craving for something to stimulate the brain while staying at home with your new joy. That sounds a bit dangerous though. Good luck with it all! I think that for anyone who can manage motherhood, being a PI should be a snap! Rock on, Kate! Less of a mom? Are you kidding? There are police moms, and military moms, and spy moms! Go get' em, Kate! Kate, I've been itching to read your first adventure. I have it here on my TBR pile. You've just convinced me to get to it faster! PS - tell Diana I enjoy the Ladykillers blog. Kate, wow, starting a P.I. business while on maternity leave. That's ambitious of you. I look forward to reading about your adventures. How fun! I want more to read from you. Thanks for writing. Thanks so much for your support! I tried to post a reply earlier and for some reason it didn't stick!